either foster or adopt and they need volunteers also to help out at the ranch. Does the ranch actually adopt-out horses/burros/mules?? Maybe I've gone blind but I see only information on fostering?? I would quickly adopt a gaited saddle mule that is 14 or more hands OR an over 3YO that would be suitable to train to saddle for trail-riding before the SA Rodeo & the associated trail-rides. Called the ranch, left message but haven't heard from them yet. It is a nice thing you are doing. That really is a good thing you all are doing to give them a home and treat these animals like they deserve. If I had the land... I always wanted goats, my first goat would be called "momo" short for Mohammed. Oops sorry it's not PC. Way to go man just wish I had a few acres to something like that. we've been making preparations for her arrival (newly fenced area = more pasture) and are anxious to take her in - we've decided to name her "Sailor Moon"
Man a couple of great looking ladies you got there. Very nice looking gals. Congrats and kudos for taking them onto a good home. We have 10 acres, and got 2 minature goats a couple yearts back. Had them for about 5 years. Those little buggers can totally destroy every tree and shrub you got. I sent them to a big farm that needed something to mow brush. They are in heaven there. No shortage of brush to eat. And the guy wants everything flattened into pasture,, so, right up their alley. But the vet made a comment one time to which I kinda agree. Wanting a goat is kinda like wanting a toothache. our on-going Equine saga - we got crossways with the rescue people - we tried acting as responsible fosterers by wanting to keep their medical needs up to date (inoculations, etc) so we asked the rescue people to send us the dates of when they received all - they refused to do that, said it wasn't our responsibility.....so - told them that we couldn't be responsible fostering people without that information and therefore we gave our notice to cease with our contract (30 day notice).....the damned people sent their son, the next day, to pick up our Moxie (Bay Mare) and our Sailor Moon (Pinto Mare) !!!!! we probably would have adopted both had the rescue people not been such a..holes ! 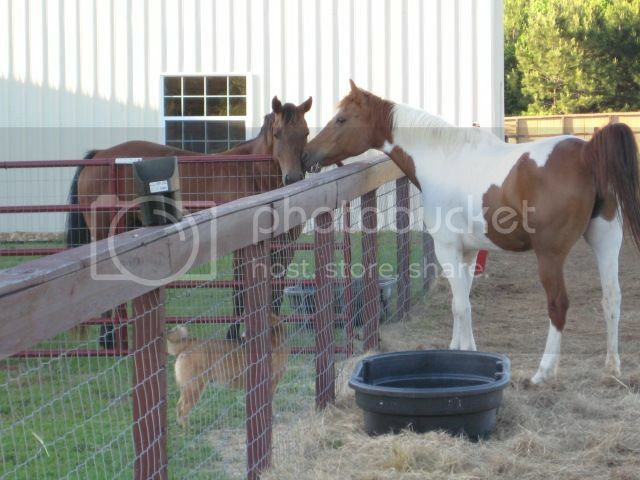 shorten the story - we've adopted 2 Geldings (a dark Bay and a Sorrel Mustang) - the Bay was one of the Conroe 200 (google it..) and has been brought back from near death 5 friggin' times - he, Cinco, and the Sorrel, Ali are the best of buddies and the SPCA was hoping that "someone" would take them as a pair - we are so happy to accommodate !